What will broadcast journalism look like in three years, five years, or even ten years? 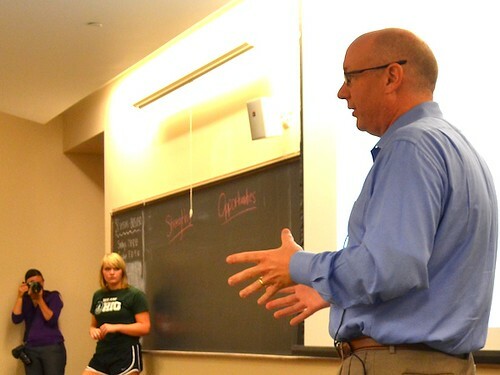 It�s Chip Mahaney�s job to figure that out, and on Scripps Day, he gave �The Future of Journalism� class a glimpse into how he answers that question. As Senior Director of Local Operations for the E.W. Scripps Company and its Broadcast Division, Mahaney examines the problems and opportunities facing broadcast television. He walked students through some of those opportunities, asking for audience participation to determine the how local television news could capitalize on strengths and overcome weakness. Sarah Rachul, a freshman in Scripps, said she appreciated how Mahaney involved students in the presentation. �He really made me feel like my ideas were important and encouraged me to expand my thoughts concerning broadcast journalism,� Rachul said. One of the first questions students asked was about social media, which Mahaney called both an opportunity and a threat. �Social media does provide layers of experience,� he said, urging students to find ways to take advantage of the �second screen� and go beyond passive TV. Kelsey Miller, a freshman in Scripps, said his presentation helped her realize just how complex the broadcast news industry could be and how important an online presence is.